When it comes to stopping mosquitoes, people will try almost anything. Those blood sucking insects can ruin a camping trip, an outdoor BBQ, and just about anything that involves evening outdoor activity. To raise awareness of the importance of controlling the mosquito population to reduce the number of diseases that people contract from them, the AMCA (American Mosquito Control Association) has declared that this week to be National Mosquito Control Awareness Week! There are many suggestions online for “natural” repellents, but the majority of these have not been scientifically proven. To help you find a real solution for your customer’s mosquito and insect problem, keep reading for a list of some proven solutions with household products, as well as some commercial repellents. Female mosquitoes can lay up to a couple hundred eggs at a time and can even do it in standing water as small as one cup. They flourish in places where there is standing water such as birdbaths, drainage ditches, and ponds. By changing the water in birdbaths and cleaning it out regularly, it is possible to keep mosquito eggs out. Another option in combating mosquitoes is to spray a very small amount of Clorox bleach over standing water surfaces. This will effectively kill the mosquito larvae before they even have a chance to hatch! Perhaps the most recognized brand in mosquito repellent is Off! Deep Woods Insect Repellent. The non-greasy spray is applied to exposed skin and clothing and protects it from insects for up to eight hours. Containing 25% DEET, this formula has the strongest chemical currently known to repel mosquitoes. If your customer’s building has a mosquito/insect problem, Chase has several options that will keep the bugs outside where they belong. The Metered Insecticide (438-5111), as seen in their product catalog, covers a 6,000 cubic-foot area and is good on other flying bugs such as flies and gnats. If you need something in a spray bottle to target select problem areas, Chase also has multi-purpose insecticides available. The FS+ Multi-Purpose Insecticide is used to target surface cracks and crevices, and is effective against both crawling and flying insects. It can even be used in food areas, making it ideal for restaurant and kitchen use! The Multi-Purpose Insect & Lice Killer is safe for use on bedding and furniture and can also be used on crawling and flying insects. Use indoors or outdoors, this product looks to target bugs where they hide. With Chase, having effective pest control in restaurants, hospitals, stores, and motels has become much easier. Another bug repellent/killer is Claire’s Bed Bug, Lice, and Dust Mite Spray (CL006). Their product catalog describes this to be useful on a variety of bugs, including mosquitoes, with the spray controlling them for up to four weeks. Besides being odorless, it can be used on fabric, clothing, and furniture making it perfect for a variety of hospitality settings including motels and restaurants. After being bit by a mosquito, it’s only a matter of time before the itching and swelling begin. There is a variety of anti-itch creams and lotions that are available, but did you know that hand sanitizer will actually help relieve itching? 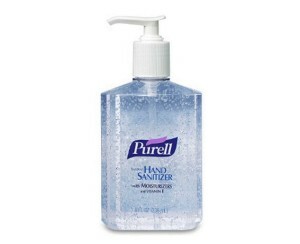 Since most hand sanitizers, including Purell Instant Hand Sanitizer, are alcohol based, they work to prevent infection while also alleviating the itch. Just pour a little on and let it sit. It does not get any easier than that! While mosquitoes are just a part of every summer, you can make sure your customers are prepared and educated on how to fight off these and other pests from invading their business. For more literature or information on any of these products, visit our Vendor Literature page to view and download the PDFs. Next story Power Through the Storm with Duracell/Procell! Stock up for the Big Game!